The Bristol Mt. Ski Patrol (BMSP) is a group of people (volunteers) who above all, love to ski, snowboard, and telemark, and share the joy of the sport with others, while we promote safety and provide credentialed outdoor emergency care, in accordance with National Ski Patrol guidelines. BMSP members come from all walks of life, and spend countless hours in training before becoming active Patrollers. The primary purpose for the ski area patrol is Outdoor Emergency Care (OEC) and timely transportation services as needed by Bristol's patrons. Additionally, the patrol function is to educate the skiing/snowboarding public to assure awareness of their responsibilities on the mountain, with regard to courtesy and safe skiing practices, while still being able to enjoy all aspects of the sport. Each on-duty patroller carries a radio, so everyone is kept up to date in the event of a problem. Rescue toboggans are stationed in multiple locations around the area, with two hilltop buildings and a base facility that contain additional equipment, including oxygen, defibrillator, evacuation ropes, and other medical supplies that may be required in special situations. Why do so many become patrollers? For the most part, it's because it gives us a chance to do things we really love: spend time on the slopes with a great group of folks, help people who need us, and educate a few more so that it will be more fun for everyone who participates. It's not always easy, and sometimes the weather and other circumstances make it less than fun, but we almost always keep coming back. You may end up skiing when you wouldn't go unless you had to be there, and find the conditions are awesome and you're loving it! 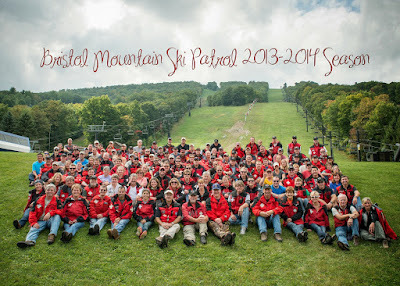 Ski patrol is a great way to meet a lot of people who share a love of the outdoors. What Happens with An Accident Notification? When we receive a report of an accident, a patroller is immediately dispatched to the site to evaluate the seriousness of the situation and request the appropriate equipment, toboggan, and/or additional patrollers to assist, as required. If you witness an accident, please report it to the nearest Bristol employee and please make sure to accurately identify the trail name and approximate location. Please do NOT call 911, as this may result in an ambulance being dispatched unnecessarily, and tying up equipment that may be needed elsewhere in the community. Two ambulance services cover our area, along with Mercy Flight, and we will utilize them when necessary.